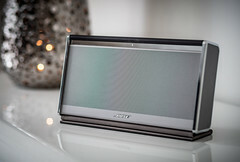 The Swedish term for a portable music player was — freestyle! This entry was posted in mozilla and tagged 2013, apps, brand promise, community, firefox, firefox os, goals, mobile, mobilize, sony, sony walkman, sumo, support, user advocacy, walkman on 2013-02-15 by David Tenser. 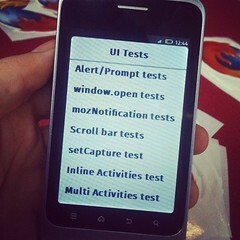 You’re reading the second part of the SUMO in 2013 blog series, and this time the focus is Firefox OS! 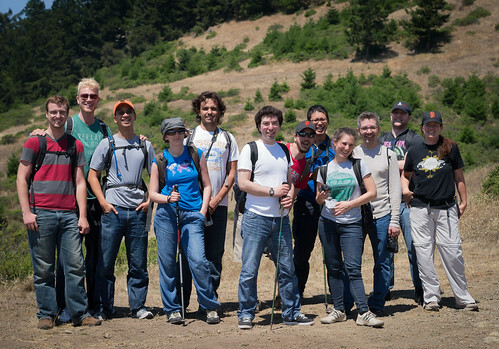 Part 2: Firefox OS — you’re reading this one right now! 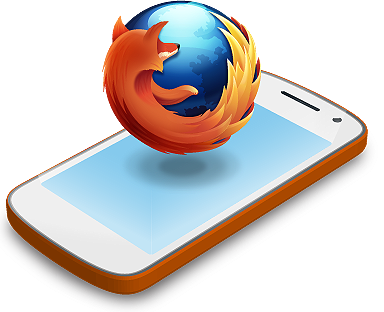 Firefox OS will produce an implementation of new Web standards to free mobile platforms from the encumbrances of the rules and restrictions of existing proprietary platforms. We’re collaborating with OEMs and carriers directly, giving them more influence to meet the specific needs of their users and market. Users and developers aren’t locked in to one platform, so they can access their info and use apps across multiple devices. Developers will no longer need to learn and develop against platform-specific native APIs. […] Consumers who use devices powered by Firefox OS won’t be locked into one specific platform giving them more choice, flexibility and freedom. With Firefox OS, the Web is the platform. 2013 is going to be an incredible year for Mozilla since it will be the year when Firefox OS and the open mobile web get into the hands of users around the world. At SUMO, we’re working hard to prepare for this and to ensure we’re ready to support users if they run into any problems. However, some things will be a little different for us compared to how we’re supporting Firefox users. These Firefox OS phones will be sold in brick and mortar stores, and the user will have actually paid with real money for it. This raises the bar of the kind of support they expect for their device, and we need to be prepared for that. Luckily, we’re not the only ones who care deeply about Firefox OS users — since the phones will be sold in stores, we will rely on our partners for the first line of defense in supporting Firefox OS. This is a great start, but we still need to make sure that those who do come to our site get the best possible answers to their questions. We also want to make sure that our partners have the best possible support material for our product so they can delight their customers just as much as we will. This means we’ll be working on delivering high-quality support documentation and training material as part of writing our knowledge base articles for users. In fact, we’ve already started and would love to see you join the efforts! Contributing to SUMO is a great way to influence the future of Firefox OS and to be a part of this brand new mobile phone experience. Our support forum platform view from a mobile device. For local communities who don’t already have a support forum and are ready to support Firefox OS users, we will be building the foundations to support localized forums on support.mozilla.org itself. This is actually something we’ve wanted to offer for a long time, so it’s very exciting that it will finally become a reality for the local communities who need it! Note that this foundation will also work for all of our other products like Firefox, but we’re building this primarily to support the Firefox OS v1 launch. 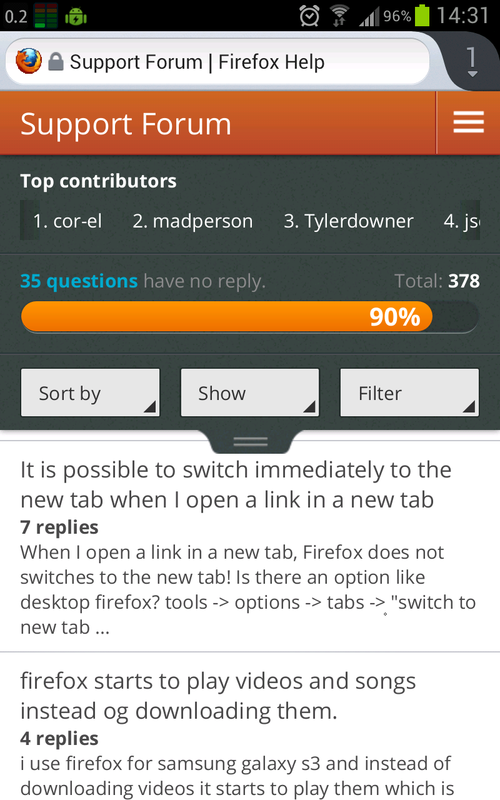 Another thing we did last year in preparation for the Firefox OS launch was to redesign the forum interface to look awesome on small screens. 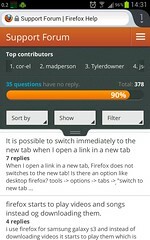 You can check this out today by navigating to support.mozilla.org/questions from your mobile phone. You only have one chance to give a first impression, and we want ours to be an excellent one. We’ll be making sure that everyone gets an answer to their questions on SUMO, regardless of whether they found our site directly when searching online, or if they were sent our way by our partners. We’re collaborating with our local communities such as Mozilla Hispano to ensure that we’re all ready for this big launch. 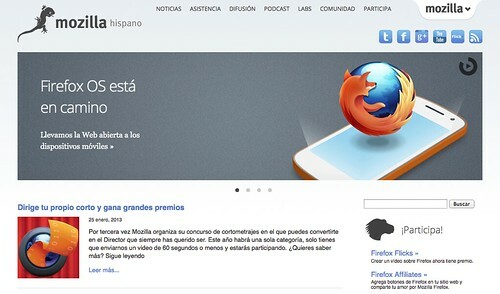 Mozilla Hispano have done an amazing job already with preparing their community and website, and they’re just as excited about the launch as we are. That doesn’t mean that no developer will ever need support, so we will be joining forces with the Developer Engagement team and implement a solution for those needs. This includes both administrative and purely development-related support. 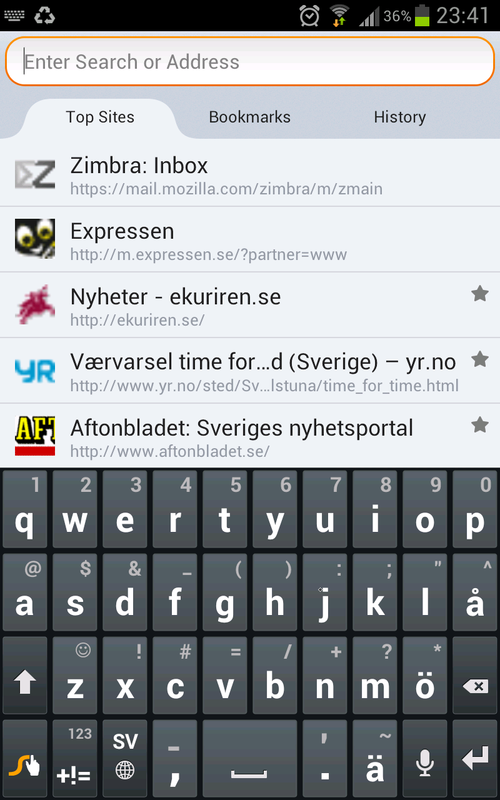 This entry was posted in mozilla and tagged 2013, firefox os, goals, mobile, phone, sumo on 2013-02-05 by David Tenser. Browsing habits are the kind of things that gradually change over time without you even realizing it. 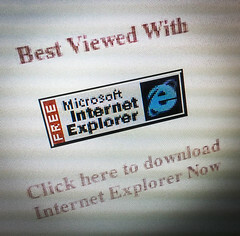 If you look back a year ago, I’m sure some of the most visited websites today weren’t even on the top 20 list then. An obvious example is that quarterly goals page from Q3 2011 that you visited every day for a full quarter, and then suddenly never looked at again. What’s even more interesting for me is how my mobile browsing habits have gradually changed into something very different from my desktop browsing habits. A couple of years ago, I used to visit roughly the same sites on both devices, but over time I found myself visiting some websites more from my mobile, and other websites more from my desktop computer. 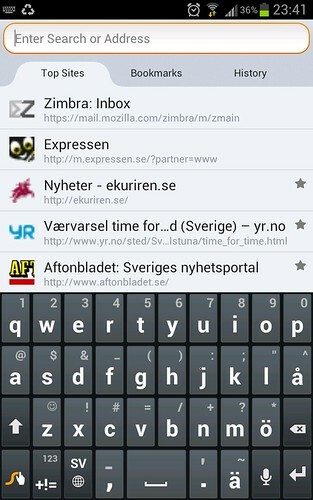 Today, the separation is very clear: I almost exclusively use my desktop computer for work-related browsing (wikis, Etherpads, calendars, reports, etc), and I use my mobile phone mostly for casual browsing (news, social media, tech, blogs, etc). Another separation along the same lines is that I mostly use my desktop computer to write, and I use my mobile phone to read. This actually makes me a little torn about the Firefox Sync implementation on Android today. On the one hand, I absolutely love the fact that I can have convenient access to all pages I visit on the desktop, and I simply can’t live without the pre-filled passwords. But on the other hand, I’m not sure I’m too crazy about the fact that all of those “Top Sites” are mixed together the way they are on the Awesome Screen. At the end of the day, I find it distracting to see ten different flavors of https://mail.mozilla.com/zimbra/#%5Binsert number here], or twenty different Etherpads or wiki pages all mixed up with the handful of sites that I actually do want to visit from my phone. This is one of the things that I like about the stock Android browser on my Samsung Galaxy Note: it allows me to define exactly how I want the top bookmarks to look like, even in which order they should appear in the thumbnail grid. 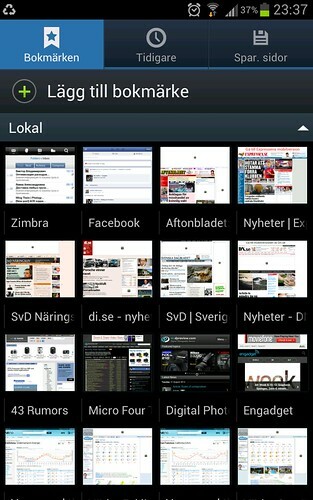 Stock browser's bookmarks grid -- pardon the Swedish and poor reading taste. An intuitive, quick way of arranging my top sites and bookmarks and ensure duplicates aren’t bubbling up at the top. An option to view the top sites as a thumbnail grid instead of a list. An option (or simply changed default) to not show the soft keyboard until you hit the text field again — I just want to click the top site rather than type on the keyboard. This entry was posted in mozilla, software and tagged browser, browsing, desktop, firefox, mobile, mozilla, phone, tablet on 2012-08-30 by David Tenser.